Charles Pulham was christened at Horham Parish Church on 15 June 1728. At that time his parents were living at Thorp Hall. 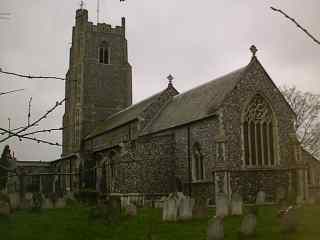 The nearest Thorpe Hall to Horham is six miles away just outside Scole in Norfolk. When Joseph Pulham married Sarah Davy in 1809 at Fressingfield church, the register entry stated that Joseph came from Stradbroke. 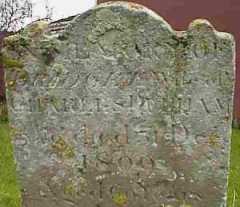 In the west corner of the graveyard surrounding All Saints Church, Stradbroke there are two adjacent tombstones for Pulhams. These were both Charles Pulhams', the father and eldest son. As you can see from the photographs of these tombstones, they have suffered over the years. Apart from weathering, they have suffered from lichen attack. You can clearly see lichen on the left hand photo. In town cemeteries, this form of attack rarely happens because pollution kills off the lichen. 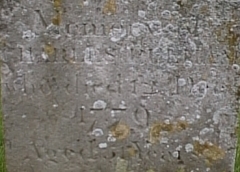 Other monuments in the churchyard are completely unreadable.